Paper Boy was born in 2005 from the need to distribute the Peninsula Pulse and Door County Living to all of Door County. Like other Peninsula Publishing and Distribution, INC companies, Paper Boy has experienced meteoric growth since its inception. Originally a distribution service for rack cards and brochures with 12 wooden display racks strategically placed in Door County, the service now boasts well over 150 rack card customers and 200+ racks of many styles and sizes. In addition to the regular rack distribution Paper Boy has also developed an impressive roster of custom distribution clients and poster delivery. Custom-distributed materials include various real estate guides, booklets, catalogs, posters, flyers, menus and more. Paper Boy prides itself on distribution efficiency and relationships formed between drivers and local businesses. 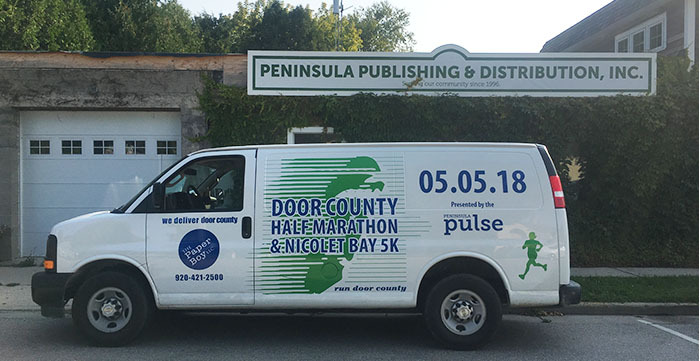 We currently have 3 vans delivering materials to all of Door County everyday. Door County weve got you covered.